November and December are months that are filled with grocery lists for holiday dinners and department store shopping for gifts. But once you have a moment to sit down, you can take the time to remember a loved one who died years ago or was recently lost. REMEMBRANCE The Hospice of San Luis Obispo County has created an event where the community can take a moment to remember their lost loved one. Gracie Rey, events and outreach communications director for Hospice of San Luis Obispo County, said it's not that people stop thinking about their loved ones, but sometimes there isn't a time to pause and think about them during the busy holiday season. 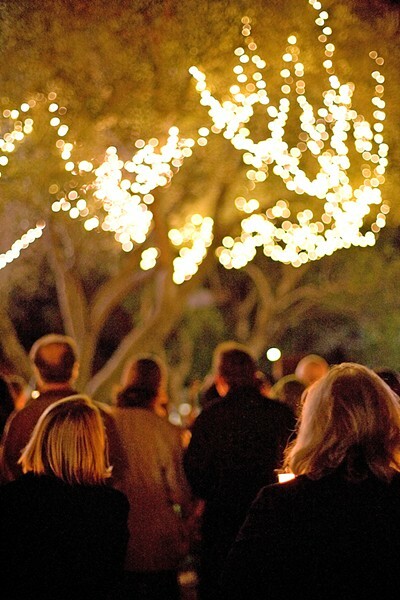 Hospice of San Luis Obispo County is coming up on its 33rd annual Light up a Life event where the community can really take that time out of their day to reflect on a family member or friend they have lost. "It reminds people to take a day to honor someone in between Thanksgiving and Christmas, before it gets too busy," Rey said. The local nonprofit has organized eight ceremonies throughout the county—in Pismo Beach, Nipomo, San Luis Obispo, Morro Bay, Arroyo Grande, Atascadero, and Paso Robles. The ceremonies are being held Dec. 3 through 8, and Rey said that the different locations will lend to different experiences. In Pismo Beach the ceremony will be held outdoors at the Shore Cliff Hotel with a view of the ocean and the breeze of the evening. In Atascadero, the ceremony will be held indoors at the Pavilion on the Lake. At the events, the names of loved ones are read aloud followed by an inspirational speaker, music, the reading of a poem, and refreshments. Reading the names gives community members that time to reflect and honor their loved ones. "People have come to this for years and years; it's just a part of their holiday tradition," Rey said. Hospice of SLO County asks for a suggested donation of $15 from individuals who'd like to have their loved one's name(s) read at the ceremony of their choice. "Someone might choose the Arroyo Grande location because that's where that person lived or that's where the death occurred," she said. The nonprofit also set up a day for people to remember their pets. On Dec. 11, the ceremony will be held in San Luis Obispo at Hospice of SLO County at 6 p.m.
"For most people, their pets become family. We have a whole pet peace of mind program because it's something that we see is a real need in this community," Rey said. She said that so many people were putting in pet names at the different locations that in between hearing a name like Susan or Jason, a pet name like Coco would be read aloud. Therefore, the nonprofit decided to have a separate day for pets to be remembered. Funds raised by the event go straight to the Hospice of SLO County, as the organization is funded solely through donations, grants, and fundraisers. "All funds stay local. For over 40 years, Hospice of SLO County hasn't received government funding; we are funded by the community," Rey said. The nonprofit is a volunteer-run hospice that does not charge any fees for the services it provides. The services include grief counseling through support groups, individual counseling services, and education about dying and death through classes, workshops, trainings, and outreach programs. To learn more about the Light Up a Life ceremonies or how to donate to Hospice of San Luis Obispo County, visit hospiceslo.org. Staff Writer Karen Garcia wrote this week's Strokes and Plugs. Send tips to strokes@newtimesslo.com.